When we consider the mechanism of the spinal adjustment/manipulation as discussed in part 1 of this series, for clarity for the chiropractic profession, it will be solely referred to as a chiropractic spinal adjustment (CSA) so as not to confuse chiropractic treatment with either physical therapy or osteopathy. In analyzing how the CSA works, we must go beyond the actual adjustment or thrust and look at the tissue and structures that “frame” the actions. Although there are osseous borders and boundaries, there is a significant network of connective tissue that plays a major role in the CSA. We will focus this discussion on the ligaments that both act as restraints to the human skeleton and also function as sensory organs, we will also examine the role of the muscles and tendons that interact with the ligaments. It is critical to realize that muscles act as active and amplified restraints in the spinal system. The neurological innervations of the ligaments play a significant role in influencing the central nervous system, both reflexively and through brain pathways. Those innervations either support homeostasis in a balanced musculoskeletal environment or creates confusion in a system that has been impaired either post-traumatically or systemically. The human body does not discriminate the etiology of biomechanical failure, it only reacts to create a “low energy” or neutral state utilizing the lowest amount of energy to function. This balanced or “low energy state” is considered the most optimal function state as nervous system function is not compromised by aberrant sensory input, this is why a “low energy state” is considered the highest function state. With understanding the full functional and resultant role of the ligaments and other connective tissues in either macro or repetitive micro traumas, bio-neuro-mechanical failure (something we have historically called vertebral subluxation) occurs. This is the basis for chiropractic care and explains why immediate (pain management), intermediate (corrective) and long-term (wellness or health maintenance) care are necessary to reintegrate the bio-neuro-mechanical system of the human body. Often, the best we can accomplish as practitioners is to support compensation secondary to tissue failure to slow down the resultant joint remodeling and neurological corruption/compromise. 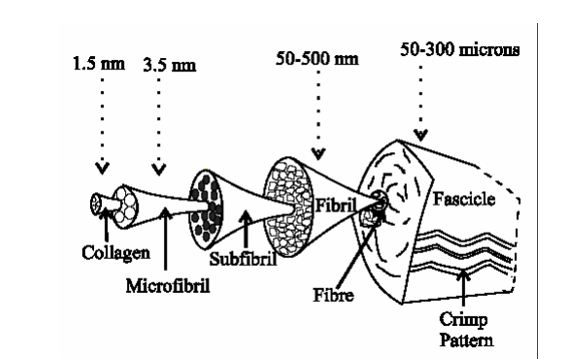 Ligaments are closely packed collagen fibers that are helical at rest in a crimp pattern. This crimp pattern allows the ligament to recruit other fibers when stressed to support the joint and helps prevent ligamentous failure or subfailure (tearing of the ligament). They are comprised of collagen and elastin which give them both tensile strength and elasticity with no two joints being alike in composition. Each joint has a specific biomechanical role and varies depending upon the needs of that joint. “This phenomenon is associated with repetitive motion when a series of stretch-release cycles are performed over time (Solomnow, 1008, p. 140). Hauser et al. (2013) reported that once a ligament is overloaded in either a failure or subfailure, then the tissue fails which results in partial or complete tears known as a sprain. When this occurs, the body “attempts” to repair the damaged ligament, but cannot completely. Author’s note: Ligaments are made with fibroblasts which produce collagen and elastin, and model the ligament throughout puberty. Once puberty is over, the fibroblasts stop producing any ligamentous tissue and remain dormant. Upon injury, the fibroblast activates, but now can only produce collagen, leaving the joint stiffer and in a biomechanically compromised functional environment. The above comment verifies that in the literature. Osteoarthritis [OA] or joint degeneration is one of the most common consequences of ligament laxity. Traditionally, the pathophysiology of OA was thought to be due to aging and wear and tear on a joint, but more recent studies have shown that ligaments play a crucial role in the development of OA. OA begins when one or more ligaments become unstable or lax, and the bones begin to track improperly and put pressure on different areas, resulting in the rubbing of bone on cartilage. This causes the breakdown of cartilage and ultimately leads to deterioration, whereby the joint is reduced to bone on bone, a mechanical problem of the joint that leads to abnormality of the joint’s mechanics. Spinal pain and the effects of the chiropractic spinal adjustment is both central and peripheral in etiology. According to Studin and Owens (2016), the CSA also affects the central nervous system with systemic sequelae verifying that chiropractic supports systemic changes and is not comprised solely of “back pain providers.” Although chiropractic is not limited to pain, chiropractors do treat back pain, inclusive of all spinal regions. Regarding pain, much of the pain generators originate in the ligaments. TheRuffini corpusclesare found deep in the skin…as well as in joint ligaments and joint capsules and can function as cutaneous or proprioceptive receptors depending on their location. The Ruffini corpuscle…is cigar-shaped, encapsulated, and contains longitudinal strands of collagenous fibers that are continuous with the connective tissue of the skin or joint. Within the capsule, the 1° afferent fiber branches repeatedly and its branches are intertwined with the encapsulated collagenous fibers. (http://neuroscience.uth.tmc. edu/s2/chapter02.html) “Ruffini corpuscles in skin are considered to be skin stretch sensitive receptors of the discriminative touch system. They also work with the proprioceptors in joints and muscles to indicate the position and movement of body parts” (Dougherty, http://neuroscience.uth.tmc.edu/s2/chapter02.html). “TheGolgi tendon organis a proprioceptor that monitors and signals muscle contraction against a force (muscle tension), whereas the muscle spindle is a proprioceptor that monitors and signals muscle stretch (muscle length)” (Dougherty, http://neuroscience.uth.tmc.edu/ s2/chapter02.html). It was suggested, as far back as the turn of the last century, that a reflex may exist from sensory receptors in the ligaments to muscles that may directly or indirectly modify the load imposed on the ligament (Payr, 1900)…A clear demonstration of a reflex activation of muscles was finally provided in 1987 (Solomonow et al., 1987) and reconfirmed several times since then (beard et al., 1994; Dyhre-Poulsen and Krogsgard, 2000; Raunest et al., 1996; Johansson et al., 1989; Kim et al., 1995). It was further shown that such a ligamento-muscular reflex exists in most extremity joints (Freeman and Wyke, 1967b; Guanche et al., 1995, Knatt et al., 1995; Schaible and Schmidt, 1983; Schaible et al., 1986; Solomonow et al., 1996; Phillips et al., 1997; Solomonow and Lewis, 2002) and in the spine (Indahl et al., 1995, 1997; Stubbs et al., 1998; Solomonow et al., 1998). (p. 144). “Ligamento-muscular reflexes, therefore, may be inhibitory or excitatory, as may be fit to preserve joint stability; inhibiting muscles that destabilize the joint or increased antagonist co-activation to stabilize the joint” (Solomonow, 2009, p. 145). 1. Single trauma or cumulative microtrauma causes subfailure injury of the spinal ligaments and injury to the mechanoreceptors [and nociceptors] embedded in the ligaments. 2. When the injured spine performs a task or it is challenged by an external load, the transducer signals generated by the mechanoreceptors [and nociceptors] are corrupted. 3. Neuromuscular control unit has diﬃculty in interpreting the corrupted transducer signals because there is spatial and temporal mismatch between the normally expected and the corrupted signals received. 4. The muscle response pattern generated by the neuromuscular control unit is corrupted, aﬀecting the spatial and temporal coordination and activation of each spinal muscle. The above stabilization-destabilization scenario is the foundation for why a CSA is clinically indicated for short, intermediate and long-term treatment (biomechanical stabilization) as clinically indicated. It also clearly outlines what the goal of the CSA is, to integrate the bio-neuro-mechanical system to bring the human body to utilize its lowest form of energy for homeostasis or as close to normal as tissue pathology allows. This is part 2 of a 5-part series where part 1 covers the osseous mechanics of the chiropractic spinal adjustment. This part covered the ligamentous involvement from a supportive and neurological perspective. The topic of part 3 will be spinal biomechanics and their neurological components in addition to how the chiropractic spinal adjustment makes changes bio-neuro-mechanically. Part 4 will be an in-depth contemporary comparative analysis of the chiropractic spinal adjustment vs. physical therapy joint mobilization. The final part will be a concise overview of the chiropractic spinal adjustment. 1. Solomonow, M. (2009). Ligaments: A source of musculoskeletal disorders.Journal of Bodywork and Movement Therapies,13(2), 136-154. 3. Hauser, R. A., Dolan, E. E., Phillips, H. J., Newlin, A. C., Moore, R. E., & Woldin, B. A. (2013). Ligament injury and healing: A review of current clinical diagnostics and therapeutics.The Open Rehabilitation Journal,6, 1-20. 4. Solomonow, M. (2006). Sensory–motor control of ligaments and associated neuromuscular disorders.Journal of Electromyography and Kinesiology,16(6), 549-567. 5. Studin M., & Owens W. (2016). Chiropractic spinal adjustments and the effects on the neuroendocrine system and the central nervous system connection. The American Chiropractor, 38(1), 46-51. 7. Panjabi, M. M. (2006). A hypothesis of chronic back pain: Ligament subfailure injuries lead to muscle control dysfunction.European Spine Journal,15(5), 668-676.